As summer draws to a close, the reality that school is about to start looms large in the minds of students (and parents) everywhere. But back to school time doesn’t have to be a stress-fest. We’ve put together this guide to help you navigate the transition between summer vacation and the structure of the school season. Start getting into your new routine before summer vacation is over. Slowly taper back bedtime and have them wake up earlier if they’ve been sleeping in late during the summer. Having a little break-in period to get used to a routine change can really help kids adjust more smoothly. Talk with your kids about what your family schedule will look like for the school year and be sure to carve out plenty of time for homework. Even if your child is older, it’s important to attend any back to school night events or orientations with them. Go meet your child’s teacher or teachers, as well as the school administrators. Get copies of school rules, class rules, syllabi, and other important forms. Review these with your child to make sure he or she understands what will be expected during the year. Besides talking about rules and expectations, discuss any other issues or concerns your child may have about the upcoming school year. For young children, this might involve discussing what to do in the event of a bathroom accident. For teens, it could be a good time to talk about how to handle peer pressure situations. Don’t shy away from talking about difficult subjects, such as bullying and violence at school. It’s important for your child to know that you are there when he or she needs to talk. Make a detailed back to school shopping list so kids have everything they need on the big day. Scrambling to get the last few things the night before the first day of school is stressful. Try to finish all your shopping and organizing ahead of time. Kids are often most focused on getting new clothes for school; make sure you get them all the other things they need, too. Find out what materials they’ll need for any classes they’ll be taking or for teams they’ve joined. Make sure instruments are tuned up if they’ll be taking them to school for music class and ensure they have all the pencils and sharpeners, pens, notepads, electronics, and other supplies they’ll need. Even if you feel tired and irritable in the morning, make an effort to be enthusiastic and excited about school. Your kids take their cues from you and your behavior. This is true even for older kids and teens who act “too cool” to care what you think. When you set the tone that going to school is a positive thing, it can go a long way toward instilling that attitude in your kids. 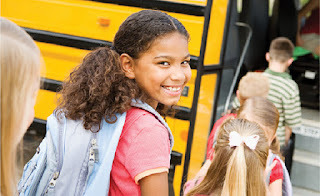 Stay organized, have a positive attitude, and get ready for back to school season early. And if things don’t go as planned, don’t sweat it. The most important thing is that you continue to support your child through the ups and downs of school.